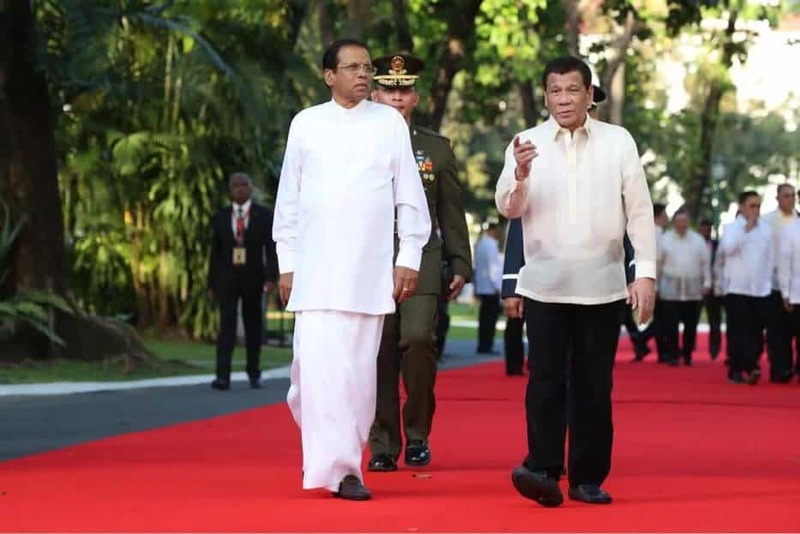 Upon the invitation of His Excellency Rodrigo Roa Duterte, President of the Republic of the Philippines, His Excellency Maithripala Sirisena, President of the Democratic Socialist Republic of Sri Lanka, undertook a State Visit to the Philippines from15 to 19 January 2019. Recognizing the importance of the visit as the first by a Sri Lankan President serving both as Head of State and Government, and only the second by a Sri Lankan leader since 1976, the two Leaders held a historic bilateral meeting to discuss ways to deepen and broaden cooperation in trade and investment, agriculture, defense, education, culture, tourism, combatting illegal drugs, protecting and promoting rights and the welfare of migrant workers, and international legal cooperation. 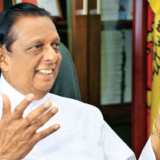 Both sides agreed that the broadening of Sri Lanka-Philippines bilateral relations serves the fundamental interests of the two countries. Both sides recognized the value of sustained multi-level engagement in providing impetus for enhanced relations, while also acknowledging that mutual resolve is required in order to initiate and receive meaningful gains from bilateral initiatives. 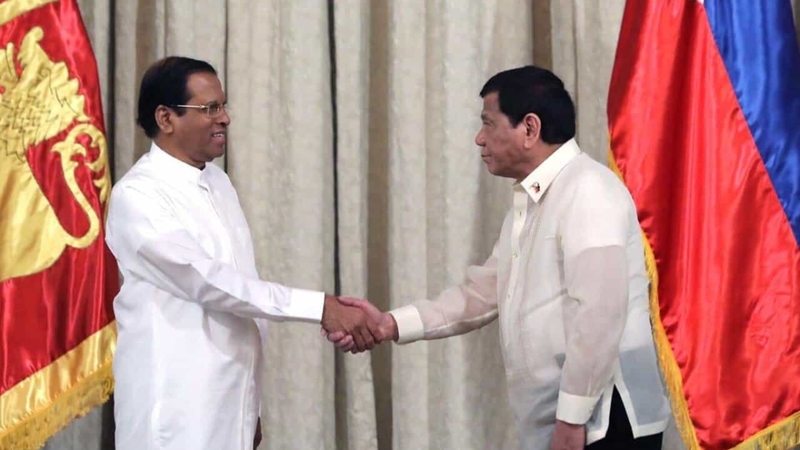 The two Leaders recognized the need to boost Sri Lanka-Philippines relations to serve mutual interests, and reaffirmed the importance of existing Sri Lanka- Philippines bilateral dialogue mechanisms to broaden cooperation, and build a stronger partnership. 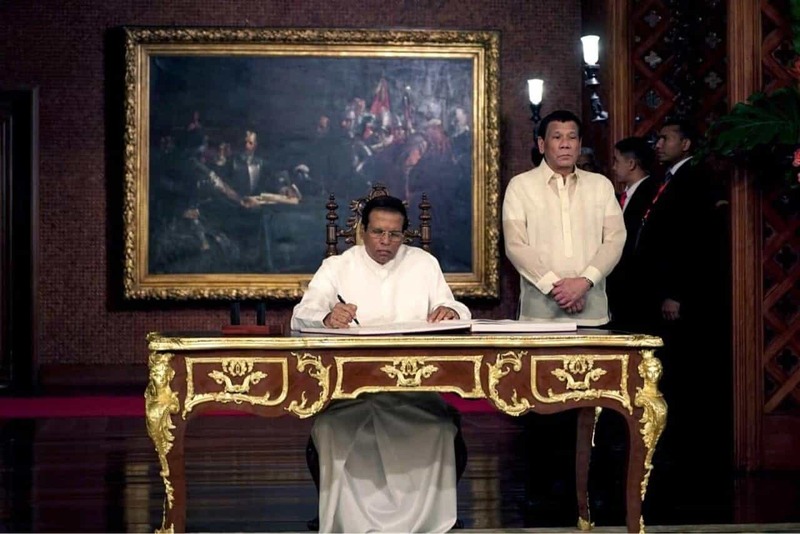 In this context, the Leaders appreciated the convening of the 2nd round of Political Consultations in Manila in October 2018 and underscored the importance of implementing decisions taken during the meeting. Both leaders also discussed ways and means to re-establish the Philippines resident Mission in Colombo. 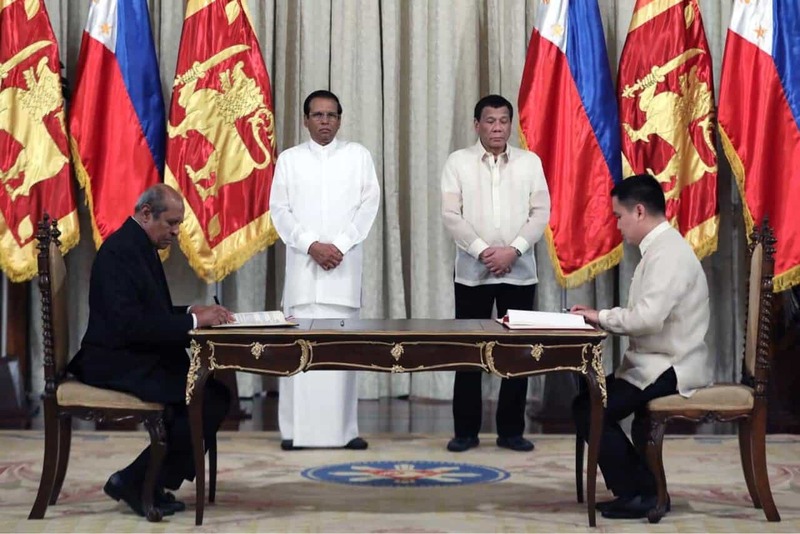 With the signing of the Memorandum of Understanding on Defense and Military Education and Training and Exchanges of Defense and Military Delegations between Sri Lanka and Philippines, the two countries recognize that defense and military cooperation are significant components of bilateral relations and contribute to regional peace and stability. Both sides further expressed interest in establishing a mechanism for intelligence sharing and agreed to continue exploring this proposed avenue of cooperation. Both sides recognized that reciprocal and joint promotion of tourism will significantly contribute to each other’s economies. 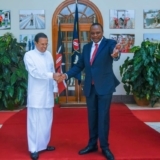 They thus welcomed the signing of the Memorandum of Understanding on Tourism Cooperation, that will strengthen cooperation in tourism infrastructure development, and facilitate two-way travel and people-to-people exchanges. With the signing of the Memorandum of Understanding on Academic Cooperation in Higher Education between the Ministry of Higher Education & Highways of the Democratic Socialist Republic of Sri Lanka and the Commission on Higher Education of the Republic of the Philippines, the two sides recognized the importance of education exchanges, particularly in higher education and professional training, including the development of institutional linkages at the undergraduate level, by providing a framework for which programs of academic cooperation may be implemented. 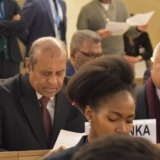 Both sides recognized the importance of migrant workers’ rights and welfare and agreed to cooperate on migration issues in international fora. Both sides recognized the value of collaboration in the field of health, including improvement of health systems, capacity building of healthcare workers and delivery of people-centered health services. Technical exchanges on disaster risk reduction on health was deemed mutually beneficial, given the context of both countries’ experiences in catastrophic natural disasters. Both sides agreed to promote international peace and security, inclusive and innovation-led growth, regional community building, as well as enhanced cooperation under relevant multilateral frameworks including the United Nations system. Both sides also exchanged views on regional developments in Asia, as well as on ASEAN-related topics, such as ASEAN-Sri Lanka relations. 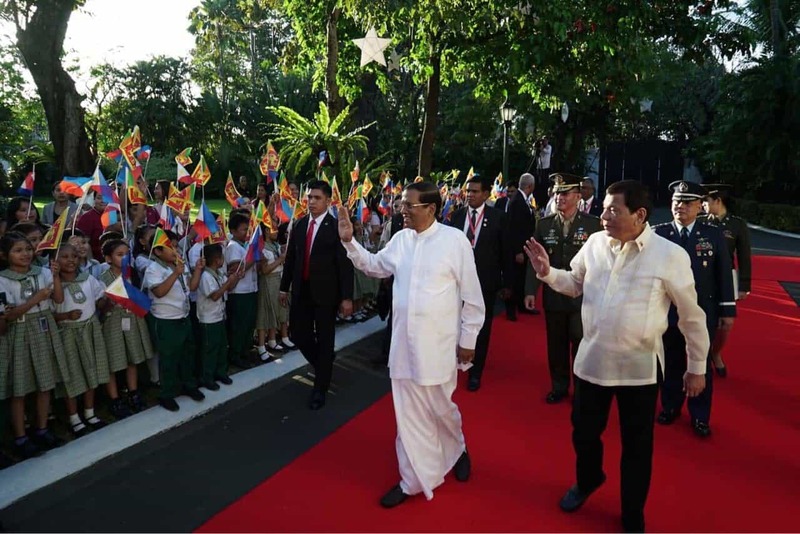 President Duterte noted Sri Lanka’s interest in establishing a formal partnership with ASEAN and encouraged Sri Lanka to continue its cooperation with ASEAN and its Member States in support of such interest. Both sides recognized the importance of maintaining and promoting regional peace and stability, freedom of navigation and over-flight in international waters, and affirmed support for the peaceful settlement of disputes in accordance with universally recognized principles of international law, including the Charter of the United Nations and the 1982 UNCLOS.